The Sturgeon Bay Common Council voted to override Mayor Thad Birmingham’s veto of its decision to allow the Teweles and Brandeis grain elevator to return to its original location on the city’s westside waterfront. The council had voted Jan. 15 to accept the Sturgeon Bay Historical Society’s offer to give the structure to the city, along with a $1.25 million donation to stabilize and restore the building. Birmingham later vetoed the move, but at the council’s Feb. 5 meeting, council members Laurel Hauser, Kelly Catarozoli, David Hayes, Barbara Allmann and Kelly Avenson voted to overrule the mayor. Members David Ward and Seth Wiederanders voted against the measure. The council also approved a measure that allows historically designated buildings to exceed the city’s height restrictions. 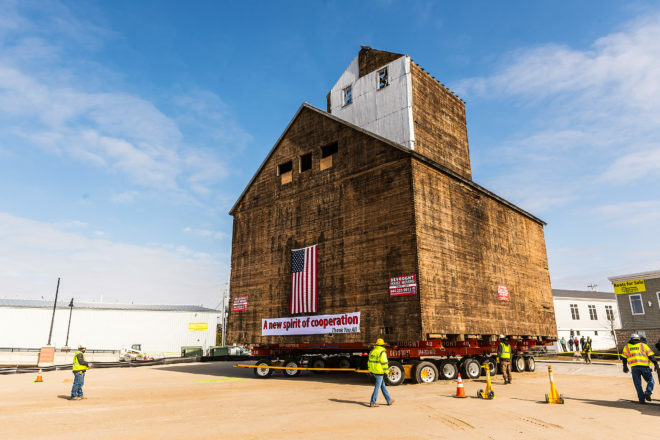 The move is aimed primarily at clearing the way for the granary to move back to its old location. It would also apply to any structure designated historic by the national, state or city registry. The council narrowly signed off on an ordinance to allow accessory dwelling units in certain city districts. The move permits the construction of dwellings above garages or in other secondary buildings and is an attempt to increase the affordable-housing rental stock in the city. Council member David Ward voted against the measure, expressing concerns that the units would become short-term tourist rentals and further eat into traditional lodging business. He also said it would impinge on the rights of neighboring property owners. Hauser pointed out that the change would require a minimum rental of seven days, severely limiting the possibility that the units would be used for short-term vacation rentals. The city plan commission would have preferred to require 30-day rentals, but a change in state law last year limits a municipality’s power in regulating such stays. Hauser noted that the recently released housing study from the Door County Economic Development Corporation applauded the county for adopting accessory dwelling units. She also said vacation-rental concerns are overblown because any home in the city can be rented through AirBNB or VRBO already. Council members Ward, Hayes and Allmann voted against the change.